In his column in The Wall Street Journal June 23, Republican strategist Karl Rove explained all the reasons why he thought President Barack Obama would likely lose his reelection bid in 2012. Rove made a compelling case: a sour economy that he doubts will improve much before next November; a Democratic base showing signs of dissatisfaction with Obama; a sharp decline in support for the president since 2008 among key voting groups such as independents and seniors; and a strategic blunder by Obama in too soon shedding the mantle of president to assume the guise of money-grubbing presidential candidate. And Rove’s analysis did not include growing dissatisfaction with Obama’s handling of wars in the Middle East, the political ramifications of high gas prices and a falling presidential approval rating that, in a late June Gallup Poll, had plunged to 43%. Put all this baggage together, and it would probably be enough to sink the Titanic, no iceberg needed. Yet amidst all this carnage, there is a big asset in Obama’s favor that has long been associated with presidents who successfully win reelection: a clear path to renomination. For some time now there has been a political rule of thumb: Presidents with little or no opposition in their party’s presidential primaries go on to win reelection, while those who must weather a significant primary challenge are defeated in the fall election. Dealing with a major primary challenge can be a debilitating exercise for a president. They are expensive, they divert the White House’s attention, and they subject the incumbent to months and months of criticism from within his own “political family.” The result is that a significant primary contest substantially increases the president’s electoral vulnerability. Since the advent of presidential primaries a century ago, five presidents have lost their bids for another term: William Howard Taft in 1912, Herbert Hoover in 1932, Gerald R. Ford in 1976, Jimmy Carter in 1980 and George H.W. Bush in 1992. To varying degrees, all five had to survive significant primary contests to make it to the general election, where, in a weakened condition, they lost. Of the five, only Hoover would probably have been defeated whether he had a primary challenge or not. The Depression was under way in 1932, and Hoover caught the blame for it. However, it is arguable whether the other four could have won reelection if they had not first been bloodied in their battle for renomination. Taft, in 1912, was running in the midst of a strong Republican presidential era and might have been able to win another term had he not first been smacked around like a piñata by former President Theodore Roosevelt in the GOP primaries. Roosevelt’s subsequent decision to lead a third party in the fall of 1912 sealed Taft’s fate and Woodrow Wilson’s election. More than a half century later, Gerald Ford suffered from a severe case of guilt by association. He was the appointed, unelected vice president of Richard Nixon, who had resigned in disgrace in the wake of the Watergate crisis. Ford did not command the deference within the party that elected presidents often do and drew a stiff primary challenge in 1976 from the conservative favorite, former California Gov. Ronald Reagan. It was a contest that Ford barely survived. Still, the nation was in the midst of another Republican presidential era, and Ford fell only two percentage points short of defeating Democrat Jimmy Carter that fall. Without the primary challenge from Reagan, Ford just might have won. Four years later, Carter had a passel of problems of his own: a sense of national malaise, the “misery index,” the Iranian hostage crisis and a primary challenge from the leader of the liberal wing of the Democratic Party, Sen. Edward Kennedy (MA). Yet even with all this, polls throughout much of the fall of 1980 showed Carter running neck and neck with Reagan, the Republican nominee. It was not until the final days of the campaign that the contest broke decisively in Reagan’s favor. Whether Carter could have won reelection without the high voltage primary scuffle with Kennedy is an open question. But the closeness of the race much of the fall gives one pause. George H.W. Bush was the last president to lose a reelection bid. He drew a “mid-level” primary challenge in 1992 from conservative commentator Pat Buchanan. The latter failed to beat Bush in a single primary, but drew nearly 40% of the vote in the closely watched, first-in-the-nation balloting in New Hampshire. The surprising result revealed GOP unhappiness with Bush for breaking his 1988 “no new taxes” pledge as well as dissatisfaction with his inability to handle the nation’s economic downturn. Bush’s reelection chances did not fade sharply until wealthy Texas businessman Ross Perot entered the race as an independent, splitting the Republican base and helping to elect Democrat Bill Clinton. But Buchanan’s long-running criticism of Bush economic policies during the primary season took a toll on the incumbent and basically kept him on the defensive throughout the election year. 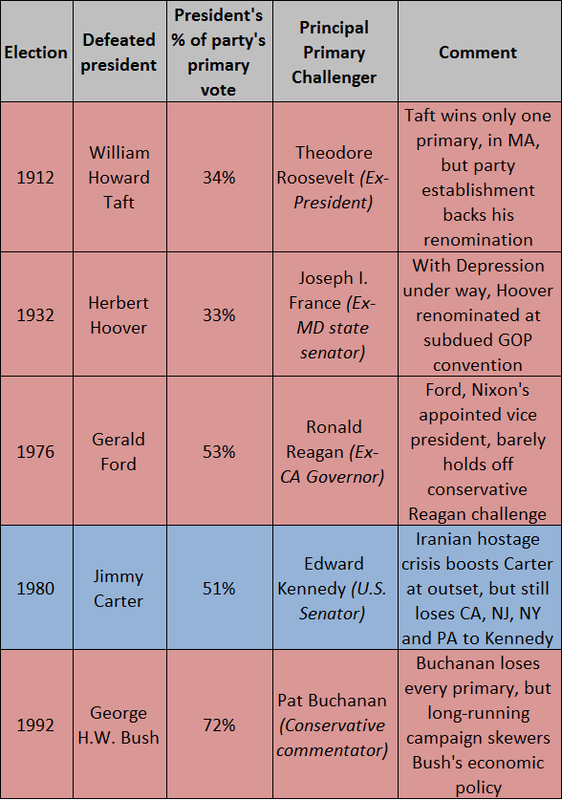 Since presidential primaries became a notable part of the nominating process in 1912, presidents who have won reelection have generally glided to renomination, while the five who lost their reelection bids first had to weather a significant primary challenge. While all five won renomination, only one (Gerald Ford in 1976) came close to winning the general election that followed. Note: Democrats are shaded blue, Republicans are shaded red. That brings us to the present. At this point, President Obama is running unopposed for renomination, sharing common ground with the last three reelected presidents: Reagan in 1984, Clinton in 1996 and George W. Bush in 2004. All three had little or no opposition in their party’s primaries. Yet in some ways, Obama is fortunate that he has not drawn a primary rival. His late June Gallup Poll job approval rating of 43% is below Ford and George H.W. Bush at similar points in their presidencies. The latest unemployment rate of 9.1% in May is higher than any other incumbent has had to contend with at a comparable point since Reagan in the spring of 1983. And the unemployment rate then was steadily coming down. In addition, a September 2010 Gallup Poll testing a hypothetical rematch between Obama and Hillary Clinton showed the president ahead of his 2008 Democratic rival by a rather modest 52% to 37%. That is almost exactly the same numbers by which Carter outlasted Kennedy nationally in their hard-fought 1980 Democratic primary fight. In short, another Democratic president not named Barack Obama might already be gearing up for a primary challenge. But what saves Obama is the historic nature of his presidency and how well it reflects the diversity that the Democratic Party seeks to project. As well, with his particular appeal to the young voters and minorities, he serves as the party’s bridge to the future. Few Democratic leaders would want to jeopardize that. And while it is not too late for a primary challenge to emerge, do not bet on it. A free ride to renomination is a major asset that Obama should be able to count on as the 2012 campaign unfolds. Since Gerald Ford assumed the presidency in 1974, three presidents have won reelection, while three presidents have not. At this point, it looks as though President Barack Obama will have his work cut out if he is not to join the latter. Compared to other recent presidents at a similar point in their tenure, Obama’s late June approval rating of 43% in the Gallup Poll ranks below every other recent president except Jimmy Carter. Meanwhile, the latest unemployment rate for May 2011 of 9.1% is higher than that for every other recent president except Ronald Reagan. Notes: Democrats are shaded blue, Republicans are shaded red. 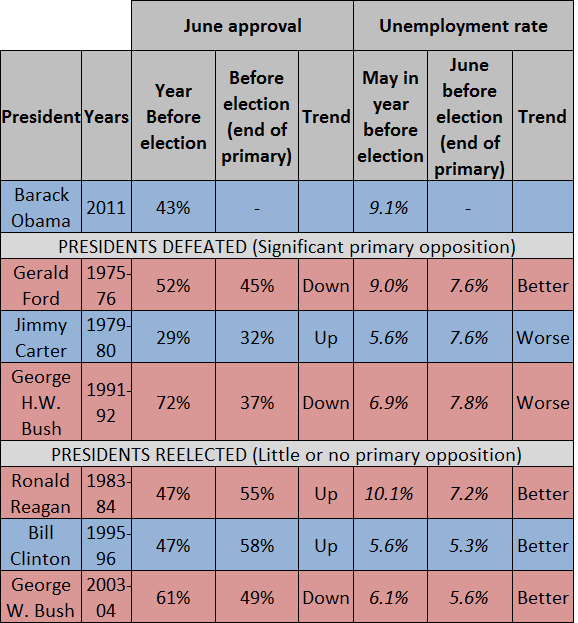 The June presidential approval polls in pre-election years reflect those taken in the latter part of the month, with the exception of Bill Clinton’s, which is from early June. The June polls in election years are from the early or middle part of the month, close to when the presidential primary season ended. Obama’s Gallup Poll rating of 43% is for the week of June 20-26, 2011. Sources: Gallup Poll for presidential job approval ratings; Bureau of Labor Statistics for seasonally adjusted monthly unemployment rates.